So I was back home this weekend for my brother's birthday (which is actually today - many happy returns, bro!) Mum was serving steak, so I offered to bring the wine. Off I skipped to the LCBO, delighted by any opportunity to shop in my favourite store yet again. 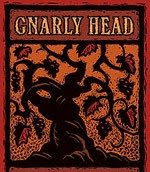 I was reaching for a great staple red, Chile's Errazuriz cab sauv, but then Delicato Vineyard's Gnarly Head 2006 Cab from California caught my eye. I dug the label; nifty tree design. Plus, I got to say "gnarly", in true surfer-dude fashion, to the cashier. (Check out the Web site; very similar to Roshambo, in that it's all about attitude: there's a party in the bottle and everyone's invited.) So I bought some. It was quite favourably received around the table (must have been, we went through two bottles! ), but I was kinda meh about it. Described as a "crowd pleaser" on the LCBO site, it's an easy-drinker, with lots of fruit, not too much tannin, and a friendly, give-your-bud-a-noogie feel to it. Mum said she liked it more than Maleta's Grape Brain, which says a lot, given that she invested in a couple cases before it was discontinued by the LCBO. My mouth was looking for more, though ... perhaps I was getting a bit too particular in my tastes? Those suspicions were confirmed as I poked around in the china cabinet, admiring a gorgeous set of red wine goblets. "If you like those, take a look at the white wine ones," Mum called from the kitchen. I rummaged some more, fishing out a slender glass with the same knobbly stem as the others. "Yeah, that one. Aren't they a great set?" "Mum, these are champagne flutes. Not white wine glasses." "Oh, WHATEVER. Are your friends really going to notice?" "It doesn't matter. I'M going to notice." Insert eye roll here. "Well, MY friends are more interested in the wine that's IN it. Who cares how it gets in your mouth?"